With war a constant fact of life for the last five years, the Federated Suns and Lyran Alliance have pushed massive resources into deploying new units as quickly as possible. Additionally, they have continued to refit classic 'Mech designs to better cope with the current devastating firepower found on the modern battlefield. The other Houses and Clans have encountered their own conflicts and have also fielded their own new units of destruction. BattleTech Record Sheets: 3067 provides filled-out record sheets for the vehicles and BattleMechs described in BattleTech Technical Readout: 3067. Additionally, more then 100 filled-out record sheets are included for variants and configurations for numerous standard 'Mech designs presented in Technical Readouts: 3050 and 3055. 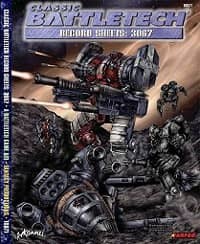 · BattleTech Technical Readouts are the flagship of the BattleTech line and this record sheet book allows the players to quickly and easily play the designs found in BattleTech Technical Readout: 3067.